The latest new/old toy to find its way to Oren's Camera Asylum is a Gowlandflex 4x5 twin-lens reflex. Why would anybody want a 4x5 TLR? It's a specialized tool that solves a specific problem in large format portraiture and candid photography. With a traditional view camera, there's a delay between the time you frame and focus the picture and the time you make the exposure, because of the need to remove the focusing hood or viewer and insert a film holder. It's easy to miss a fleeting expression, or to have the subject drift out of the narrow zone of focus of a large format lens used at a wide aperture. There are other partial solutions. A technical or press camera with a rangefinder, such as a Linhof Technika or a Graphic, allows you to focus with the film in place. However, the rangefinder on these cameras is separate from the viewfinder, and it's often necessary to reposition the camera for final framing after using the rangefinder to focus. An SLR like the Graflex also allows you to focus with the film in place, but the view through the finder is blacked out at the moment of exposure because of the mirror action. A TLR is the only solution that combines all three conveniences: focusing with the film holder in place, making the exposure without further shifting of camera or viewing position after focus, and viewing the image at the time of exposure. It's not surprising that the creator of the Gowlandflex, Peter Gowland, made his living as a glamor and portrait photographer. This Gowlandflex is an early model with a body made of wood and leather, like an old Graphic. The depth of the body means that the shortest focal length it can accommodate is 180mm; that's a long normal for 4x5, consistent with the camera's intended use. I contacted Peter to find out about getting a spare ground glass and an extra lensboard. 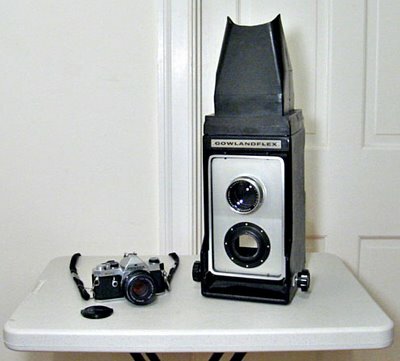 He looked up the serial number and reported that the camera had originally been sold in June, 1965, at a price of $560, including a Schneider Xenar viewing lens and Symmar taking lens. The handy Bureau of Labor Statistics inflation calculator (link from here) tells me that this corresponds to roughly $3600 in today's money. The 210mm Xenar is still there, but the Symmar must have been separated from the camera long ago. The photographer who sold the camera to me used it with a modern 210mm Nikkor-W. I'll probably try it first with a 210mm Rodenstock Sironar-N that I have on hand. Because the actual focal length of a lens is often slightly different from its marked focal length, it will be important to test whether the match between the old Xenar and the Sironar-N is close enough to allow for accurate focus across a useful distance range. If not, I'll need to look for a different combination. In the meantime, best wishes to all for a turkey even bigger than my Gowlandflex, and a happy and healthy Thanksgiving holiday! Afternoon Update and Trivia Quiz: In writing this post, I overlooked another 4x5 camera type that offers all three conveniences (focusing with the holder in place, combined viewing and focusing, and no finder blackout). An extra slice of pumpkin pie for the T.O.P. reader who can identify the cameras I have in mind. They're expensive, but considered a unique and valuable tool by some top photographers. I'm guessing you have the Littman 4x5" Single in mind as the other camera that allows combined viewing and focusing with the holder in the back and no shutter blackout. I've never considered shutter blackout an issue to worry about, even with my 5x7" Press Graflex. You view until the instant of exposure and press the shutter. As the old Graflex ads state, "There is no guesswork." Whether I can see what's in the frame or not at that moment is unimportant, because I've already set it in motion, and I almost always see on film what I anticipated. On the occasions when I don't, then having been able to view the image simultaneously with the film wouldn't have prevented me from missing the shot, so in such situations, I try to get more than one good shot to account for random factors. I think you are talking about the Litman 4x5. Speaking of which, if you want to see some total internet craziness, skim this thread. What about this one.... wow, what a monster!